The Sandlot is not a 'great' picture if by 'greatness' you mean something revolutionary or innovative like Citizen Kane or Seven Samurai. If by 'greatness' you mean emotionally moving and even beautiful, then I have no problem calling The Sandlot a masterpiece. It hits me on the same level as Casablanca hits me. Bet that's a comparison you've never heard before. However, just as I am brought to tears by Rick & Ilsa's farewell, I am also moved to smiles and laughter at the hijinks of our group of regular kids during one special summer. There are many reasons why various people love The Sandlot. Some hold it dear for the nostalgia it evokes, a time when they were kids and the greatest crisis they faced was getting the ball that flew over the fence. For others, it is is the sport of baseball itself, the joy it first inspired in them to follow and/or play this most magnificent of games. I can only say that for myself, The Sandlot holds a special place in my heart for one reason. I Am Smalls, oversized cap, buttoned-up shirt and all. Scotty Smalls and I have so much in common. We both are more academically than athletically inclined. We both have fraught relationships with our fathers/father-figures. We both yearn to fit in but struggle with being part of the group. We both have poor knowledge of Yankee legends. Smalls more than anything wants to fit in with all the other boys playing out in the sandlot, but it is clear he has no knowledge or skill in sport or socializing; his only attribute is heart. If one remembers, the other boys save one had the same reaction to Smalls' first bungled attempts to be like them: laughter and contempt. They really wanted nothing to do with him. I Am the Original Last Boy Picked. I would say that my experiences were more horrific than Smalls, which I will share with you in the hopes you don't laugh. In elementary and middle school P.E., the coaches would pick certain students to form teams. It was already humiliating enough getting chosen last, but there were moments that to my eight to twelve-year-old mind, were more ghastly. There was the time they picked someone with a broken arm over me. There was the time when, after I was the last one left and they had to take me, the other 'teammates' groaned, loudly, at my inclusion. While I cannot remember if this was the same incident or a different one, I remember when the others ran up to the coach and begged him to move me. Things like that eventually eat at one until their perceptions of you becomes your perception of you. I soon internalized those views until I could barely tolerate myself. If one thought that such things ended after high school, think again. Even into my twenties, the 'cool kids' still made it clear I wasn't 'one of them'. My then-church began a softball team and invited people to tryouts. I bought a glove, did my best, and was not only not called back, I just wasn't called, but I was encouraged to support them team financially. The knowledge that they proclaimed the love and acceptance of God but wouldn't extend that same love and acceptance to me is something I still think on. Smalls, like myself, had a desire for that male figure. Smalls' stepfather Bill (Dennis Leary) was not cruel or violent, but he was a bit distant and at their first catch practice, dismayed at Smalls' ineptness. Unlike Smalls, I had no stepfather, my mom deciding to not remarry after her divorce. My father opted not to be part of my life for his own reasons. Bless single parents, fathers and mothers. They do an extremely difficult job, the work of two. I love my mother, but try as she might, she could never be the father I needed. She's the type to cry at Douglas Sirk films, the kind of woman who is puzzled as to why I'd get irritated at Hour Three of shopping and who is flustered at my inability to declare whether the seventh turquoise blouse she's tried on is nicer than the fourth jade blouse she's tried on. In short, she is too much of a woman to be a father. How could a woman who, while aware of who The Great Bambino is, really does still think his name is "Baby Ruth" really be a guide into the Wide World of Sports? Speaking of 'Baby Ruth', I have my own 'Smalls Knows Nothing About Baseball Story', one that you are free to laugh at since I laugh at it myself. I went to Yankee Stadium for the first time in 1997. Before going in to see the Yankees/Blue Jays game, my cousins and I stopped at a Yankee shop nearby (my memory says it was across the street). As I looked around, I saw one player dominate the merchandising: pictures, posters, cards, shirts and all other type of paraphernalia. After marveling at all this for a few moments, I said out loud to no in particular, "Gee, I guess this 'Derek Jeter' must be pretty good!" In my defense, I never watched sports and never pretended to know who any of the players were. In all of this, I may wandered off a bit, but now I'll delve deeper into here I share why, for me, The Sandlot has become so special. Many love the nostalgia and the love of baseball the film has. For me, however, it is the friendship between Scott Smalls and Benjamin Franklin Rodriguez. Benny to a point does have an ulterior motive in bringing Smalls in: with Smalls, he now has that ninth player to make a full team. As such, he can now devote himself more fully to his great passion. After all, for the rest of them, baseball was just a game. For Benjamin Franklin Rodriguez, baseball was life. However, I think Benny saw in Smalls something the others didn't: a shy, socially awkward boy who really wanted friends. Benny was the only one who didn't laugh at how clumsy and uncoordinated Smalls was. He instead opted for a different route which most people, certainly more kids, don't take: he served as mentor, guiding Smalls and showing him how things work. He also showed him genuine kindness, never judging him for his lack of skills or knowledge. That isn't to say Benny wasn't at times flabbergasted at Smalls' behavior, ranging from walking all the way to the mound to give the ball back to his cluelessness about 'some lady, Baby Ruth'. Even then, when Smalls reveals how he just casually hit a Babe Ruth-autographed ball into The Beast's backyard, Benny still doesn't become enraged at having his own hero's ball lost. He isn't happy, but he also realizes that Smalls' over-eagerness to fit in was the reason for this disaster. One of my favorite scenes is the Carnival Ride scene, not just because it's both funny and true to kids trying to be adults and failing spectacularly at it. It's also because of a little detail that gets missed. As Bertram and Ham attempt to explain to Smalls what Big Chief Chewing Tobacco is, we see Benny in the background, similarly astonished at Smalls' naivete. However, if you see the scene, you see him puts his hands on Smalls' shoulders in a comforting way (while also putting one hand to his forehead and shaking his head in disbelief). To me, that subtle moment says everything about the Smalls/Rodriguez relationship: Scotty, well-meaning but unaware, and Benny, always looking out for him while still astounded at this kid's total obliviousness to what should be basic boyhood information. In my own life, I had three Benny Rodriguezes: Kris Z., Ryan G., and Gabe P., who came into my life in my early-to-mid-twenties. In tandem and individually, each guided me around sports. It ranged from Gabe showing me how to throw a football, the sport that is his passion, to the three of them inviting me to join them in playing even when they knew my skill level was none. They never openly harangued me if I made a major mistake. They all took the time to explain something if I didn't understand it. Sometimes they can be a bit excessive in their assumptions about my lack of knowledge or athletic prowess. Yes, I knew the difference between the Dallas Cowboys and the Dallas Mavericks long before they came around. Once, at a Thanksgiving Day football scrimmage, I think I genuinely shocked them when I managed to actually avoid their tackles. At that game, when I scored a touchdown, it was one of my proudest moments. I was even proud of my football 'injury' and didn't mind that my toenail was gone and I was bleeding. However, Kris, Ryan and Gabe, like Benny, guided me into sports and never passed judgment, never mocked me and never excluded me. They are, curiously enough, Christians as well, and I say 'curiously enough' because unlike the softball team grandees these three drink, on occasion curse, have failed on other matters and for a time were even into chewing tobacco (which they have all left). It's as if Kris, Ryan and Gabe were the sandlot kids and the other group was the snooty baseball team who challenged them midway through the film. I make no judgment on either group's faith. I only report. It's interesting that out of all the sandlot team members, only two made baseball their careers. DeNunez played AAA, but the others drifted into 'real life', sometimes for good (Squints and Wendy), sometimes not (Bertram, lost to the 1960's). Benny 'The Jet' Rodriguez's future was certain: you don't get otherworldly visits from Babe Ruth if he didn't think you were worth it. His mix of natural talent and intense work ethic got him to be a Major League player. Benny reminds me of someone like Cody Bellinger, someone who had extraordinary skills as a kid who also worked hard as an adult. He also brings to mind someone like Jose Altuve, who would not let his 5'6" stature hold him back. Perhaps others, well-meaning or not, told him his height would not allow him entry. Despite having other excellent players such as Aaron Judge tower a whole foot over him, Altuve, like Rodriguez, worked to achieve his goal. He followed his heart, and he never went wrong. Smalls' career, however, is a surprise: the boy who at the beginning of The Sandlot wouldn't know the baseball player from the candy bar became a sports announcer, which requires both a great knowledge of the game and great passion for it. If one thinks on it, a sports announcer is the perfect job for Scotty Smalls: someone who would even with hard work never match Benny's skills, but who had vast intelligence, a love of knowledge and the joy of a fan. The Sandlot is very romanticized nowadays, clouding us to its cinematic flaws. It is not a 'great' film. It's not even a 'great baseball film' compared to such work as Bull Durham, A League of Their Own or Pride of the Yankees. However, I don't think or ever thought The Sandlot was meant to be a 'great film' to rank with Vertigo or The Passion of Joan of Arc. It was meant as a sweet, nostalgic look at how many, particularly men, would like to remember their youth, even if it is nowhere near what it actually was. For me, The Sandlot is special because I see myself not in the heroics of Benny, the cockiness of Ham or the goofiness of Squints. 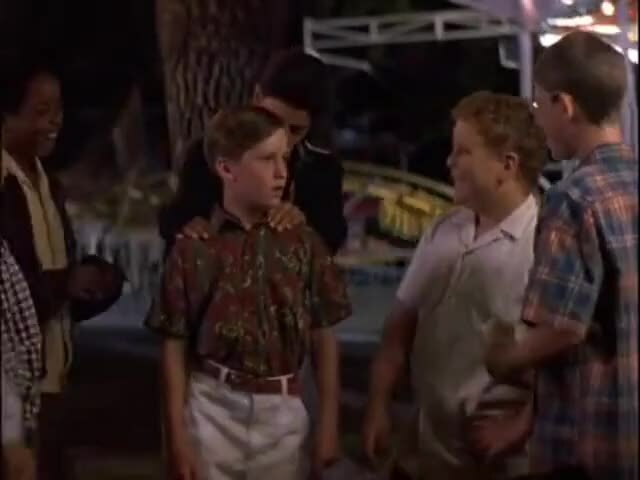 It's because I see myself in Scotty Smalls, the boy who knows he isn't any good at sports, who has trouble making friends, but if given a chance can show he's really no different than the rest of the gang. If you give him a bronzed tone, it could be a picture of my early years.